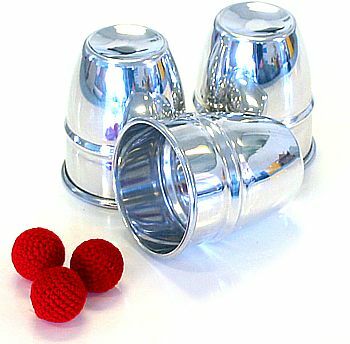 Discount Magic - Combo Cups & Balls Aluminium. A solid through solid penetration. Three small balls placed under three metal cups seem to magically jump from one cup to another appearing and vanishing in a mysterious manner. This set also includes a CHOP cup for added effect. Combo Cups & Balls Aluminium A solid through solid penetration. Three small balls placed under three metal cups seem to magically jump from one cup to another appearing and vanishing in a mysterious manner. This set also includes a CHOP cup for added effect.